日本シタール協会 理事長 Mr. Teiju Kato of Tokyo , Japan who I have pleasure to state , has been learning Sitar under my guidance for a long time . He has acquired extensive knowledge about the origin of Dhrupad style of the 300 year-old Vishnupur Gharana ( school of music ) . He has mastered the " alap-ang " which includes the sanchari and abhog in Dhrupad style , following the Guru-Shishya tradition . He can demonstrate with proficiency , the different stages of instrumental recital and is maturing into an ableperformer . 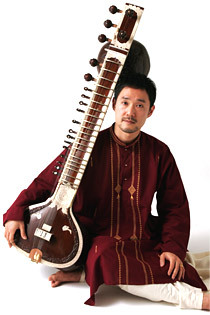 He has given recitals in music programmes in India and in Japan and has received much applause from the audience . As a Guru of Hindusthani music , I am very happy with a student of his calibre and wish him success in this field . © 2007 TEIJU KATO. All Right Reserved.